I struggled to see through time to witness with her that visual memory; to share a moment before my birth; to acknowledge a shared knowing, if nothing else. Age brings incredibly beautiful textures to the human face, softened wrinkles that move with each smile and echo inheritance from parents and grandparents. They embody personality and character and tell the richness of experience that eyes and lips sometimes fail to speak. As “Jeanie” surveyed the calm blue reflective waters of St. Jacques harbour her expression was of satisfaction and delight; of memories flooding to fill spaces she hadn’t seen in years. In the quietness of unspoken thoughts her face betrayed them, sharing with me both tension and ease, the distance between her yesterday and the fleeting moments we shared that day. It was a privilege and a joy to accompany this woman around the harbour and reminisce about people, houses and events that shaped both of our lives in ways neither of us could have ever known about the other; an experience where the verisimilitude of her past contributed to the plenitude of my feelings for our shared sense of home. It all began a couple of hours earlier in an encounter with a group of people standing on the roadway near our house. A conversation soon ensued which determined the group to be Jean Fitzpatrick Drake and some of her family visiting from Cape Breton. I grew up hearing her name as “Janie” Drake thus that pronunciation is ingrained in my lexicon regardless of how I spell it. During her adult years in Nova Scotia Janie became known as Jean. Seeing her that afternoon brought forth feelings of family, of connectedness and rediscovery. Excitement was electric as we coaxed them to come into our house. It became a turning point of knowing for me, a juncture beyond which there would no longer be mystery or wondering about who and where ‘Janie” Drake was and is. My father was a close friend of George Drake all through my years of growing up. The three of us spent many hours together as did some of my siblings. Somehow I knew there was a family connection; not close enough to be firsthand knowledge for me but close enough for my father to value the relationship; hence the regular visits and socializing and exchange of family photographs. Standing in my living room that afternoon was my cousin, a cousin I’d heard of but had never met; one who had presence in my life, but no physical substance for she had left home before I came into the world of St. Jacques. Her return visits over the years must have gone unnoticed by a child for I had no recollection of seeing or wrapping my arms around her or she, me, prior to that day. There are simple joys in life that sometimes go beyond measure, beyond words and beyond expectations. A fortuitous meeting which might have never happened had we been ten minutes earlier or later led to making a connection between two cousins separated by time and distance. Jeanie’s story starts long before this visit to St. Jacques in a time when the community was still prospering from the lucrative cod fishing industry. There were a constant parade of schooners from other south coast ports calling at local wharves and along with them came their crews. New faces, young men who sought out the local girls to take to a dance at the Parish Hall or simply to flirt with during the few days they were in port, exuded optimism for their chosen occupations and offered new opportunities for those girls seeking a life partner. Jeanie’s mother, Frances Drake, was one of those young women. Captivated by Richard Fitzpatrick of Marystown, visiting St. Jacques on a schooner taking on water for the trip to the Banks a dashing robust young man hardened by the rigorous work of a schoonerman, she fell head over heels in love, married and moved to his hometown. Bill and Maryann didn’t stand in her way despite their trepidation of having their daughter move away from home. In the end they gave their blessing and resigned themselves to the fact that any visiting to the new couple and any children they might have would take days of travel. That difficulty grew when the first child of Frances and Richard, christened George, died shortly after his birth. Undeterred and determined, not long afterwards Frances was once again able to tell her parents that she and Richard were expecting. This time the baby boy was baptized William. It was 1922 and things were beginning to look up for the newly married couple. Maryann began looking forward to the next child, hoping this time it would be a girl. The joy of having a granddaughter brought both delight and concern with the spectre of the firstborns death still fresh in the air even though William was healthy and walking by then. Soon after the baby’s birth Frances began experiencing difficulty breathing, accompanied by bouts of coughing which was attributed to being Pertussis (Whooping Cough), a particularly contagious respiratory tract infection. This was prior to the development of a vaccination and was often fatal to infants who contracted it. Fortunately the baby didn’t have any of those symptoms. In a letter home to her mother Frances told of how she had developed pneumonia and was experiencing a sore side, however, she asked her mother not to worry, she wouldn’t die from it. Fourteen months after Jane’s birth, Frances at age twenty-nine on January 25th 1925, succumbed to a disease which claimed the lives of many young people in rural parts of Newfoundland – tuberculosis. Back in St. Jacques the news was devastating. How would Patrick manage with two small children? Work was critical to survival thus the question of what would become of William and Jane was an immediate concern. A decision was made. Maryann booked passage on the coastal boat for Marystown. Jane was brought back to St. Jacques to be raised by her grandparents along with their youngest son George. This is where she gained the name Janie Drake. William remained in Marystown to be raised by his paternal grandmother. The two children saw nothing of each other for fifteen years; not until Janie was on her way to St. John’s to take a job. She left the coastal boat which had taken her to Argentia and boarded a train where Bill, knowing she would be there, came on board to meet her. The power of sibling relationship had not dissipated in the intervening years and grew stronger with time. They remained close until Bill’s death in 1980. In the meantime Jane’s father remarried and had five more children whom Janie has had contact with over the years. The Drake house in St. Jacques sits abandoned now, its windows empty of the warmth of home. One doesn’t have to work hard to imagine a young girl kneeling on the daybed fitted against the kitchen wall under a harbour side window, staring out into Fortune Bay, watching the coming and going of vessels, waving to passers-by and day-dreaming of what Marystown meant. Childhood had its hurts as well as its joys. One morning Janie awoke with a sore throat, a rising temperature which soon grew into a fever, a headache and aches throughout her body. The dreaded Scarlet Fever had arrived. Other children in the community had already suffered through the week-long experience. Doctor Conrad Fitz-Gerald, who lived nearby on the other side of Pittman’s Brook, was summoned. This was just one more hurdle for Janie to get beyond, and get beyond it she did. The 1930’s were challenging time for families in small communities like St. Jacques, nearby Belleoram and English Harbour West. The Great Depression was felt by every family and Janie’s was no exception. Work was scarce thus many young people moved away from their homes in pursuit of employment. 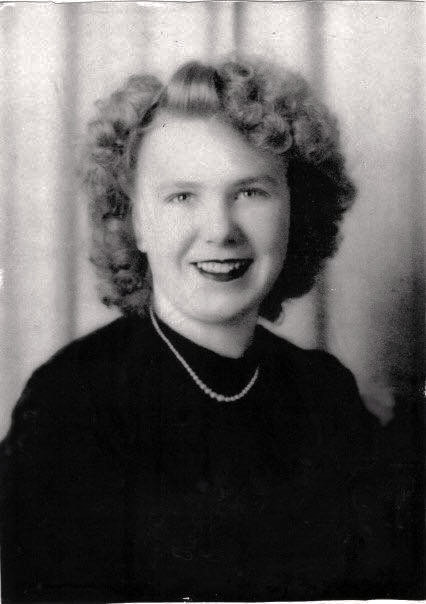 Some of her immediate family and cousins found work on coastal boats at a young age including her brother Bill; others moved to places in Canada to stay with relatives while they looked for jobs. That expectation became the norm and at the end of the decade at the youthful age of sixteen Janie walked up the gangway to the S. S. Burgeo and booked passage to a job waiting for her at the Woodstock Colonial Inn on the outskirts of St. John’s. World War II spread a cloud across the south coast of Newfoundland and elsewhere with reports of submarines sightings, the threat of ships being torpedoed and a growing list of young people leaving home, volunteering for service in the Canadian military. There was evidence of the war effort everywhere with much talk of joining up. Janie decided she too could contribute to the war effort on behalf of Newfoundland and Canada. In 1942 this determined young woman from St. Jacques travelled to North Sydney in Nova Scotia with the intent of moving to Halifax where she would be joining the military. Arrival in North Sydney meant standing in line in a cordoned off area while immigration officials processed the papers permitting entry into the country. North Sydney was a special place for Jane whose name took on a new pronunciation of Jean. There were many relatives living in the town and surrounding area; people who had moved there during and prior to her lifetime. She was met at the Terminal by her grandmother’s sister Sarah Penney (nee Hickey) who along with her husband Ambrose had immigrated to Canada in 1906. Sadly Ambrose died in 1912 leaving Sarah to raise their children. It was into the midst of this family that Jean settled after her arrival. In addition to her aunts and uncles Jean had cousins to connect with; the children of her mother’s brother Tom Drake who had left St. Jacques some years earlier. Life in North Sydney held a certain appeal to the young woman and brought enough influence to entice her to stay and seek employment. She found that at the Hamilton Memorial Hospital located on Groat Hill at the top of Convent Street. It was here she was working when she met and fell madly in love with Donald Ephrem Merritt, known to his friends as Ephrem. Their union produced six children whom Jean raised as a stay-at-home mom. Jean’s children were born into a growing community of Newfoundland expatriates which over time included her cousins Bill, Pat, Con and Betty Drake. Trips home became a regular part of the Merritt family vacation schedule with visits in both summer and winter. 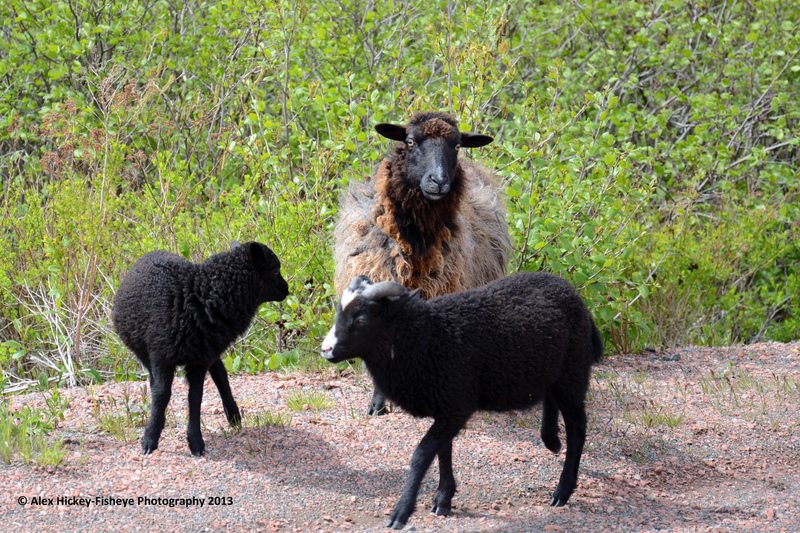 A passage booked to cross the Gulf invariably left Jean with tingles of excitement in anticipation of the journey along the south coast of Newfoundland on one of the stately coastal boats calling into many small coves and inlets along the route. By the time her children were born, ‘home’ in St. Jacques meant her uncle George whom she grew up with as a sibling and his wife Anna who now were the sole occupants of the family homestead. Jean’s visit which began this article coincided with a 2012 Come Home Year in St. Jacques. Some of her children and grandchildren were able to share in the experience of looking back, looking around and feeling what it means to be in her ‘home’. With six children, eight grandchildren and three great grandchildren Jean can reflect back on her years in St. Jacques, her years in North Sydney, her fifty years of marriage to Ephrem and feel accomplished. She does this from time-to-time with clarity and confidence. That shouldn’t suggest she sits around reminiscing all of the time. That would be a major mistake for Jean maintains a vigorous social calendar and loves to travel. Each year she makes a trip to Halifax for the Royal Tattoo, has visited many Canadian and American cities with particular fondness for Ste. Anne de Beaupre in Quebec. At eighty-nine Jean fulfilled a long standing desire to visit Cuba. Who knows where the resilient spirit of Jean (Janie) Drake will take her as she approaches her ninety-fourth birthday. Wherever she goes, whomever she encounters she leaves in her wake a respect and admiration for her incredible strength, patience, empathy and determination. Her presence isn’t based upon her size or the boldness of her voice, it emanates from her calm exterior, her knowing smile and the sparks of electricity in her eyes. You know she enjoys life, people, a good chuckle and that place which shaped the values and beliefs of a young girl ‘who grew up’ in a house on the side of the road overlooking St. Jacques harbour. This is a beautiful story of a beautiful lady that I have the privilege of knowing.she has a very kind heart and she was always there when we needed her.i will never forget what she did for me and my grandmother.she will always have a place in my heart forever. Our family cannot thank you enough for writing about our beautiful mother. We have great memories of St. Jacques ourselves and will continue to make more. God could not have given us any better a mother than he did and she continues that as a grandmother and great grandmother. We are blessed indeed. Thanks again. Thank you so much for writing such a beautiful piece about my grandmother, Janey. She shares with us an amazing life. We love her greatly. A beautiful story about a beautiful lady she was like a sister to my father and mother and an Aunt to us we love her and are so blessed to have her still with us!!! A beautiful Story about a beautiful Lady , whom I am proud to call my Aunt. This is such a beautiful story about a beautiful, kind lady. What a precious keepsake for the Merritt family! It’s so nice to have Family history wrote in such a way to be passed on to you all. I loved reading this beautiful story. Have memories of being at her house as a child. She always had a smile and welcomed everybody in her home. Love hearing stories about life in the outports of Newfoundland. God Bless you Mrs. Merritt . Thank you Alex, I love reading all your stories about St. Jacques and its people. We moved from there in 1942. I was 9 years old. My husband and I visited for overnight once in 1986, stayed with Anna Mary Drake and tried to rekindle some of my childhood memories. It seemed everything had changed on me….even our family house, next to Edgar Dyetts… was missing! However, as I was reading your post today the name “Janie Drake”, rang a bell! I’m sure my brother George went to school with her in St. Jacques. I remember names like- Janie, Gladys, Sadie, Ella, that he used to tell me about. I so loved hearing his stories and reminiscing about our early years. I am so glad to be on your list and look forward to your excellent writings. I still might make that last visit home to St. Jacques yet! Sarah Penny mentioned in this article was my Great Great Grandmother. I would be interested in making the connection to which one of her sisters was Janie’s grandmother!